Breaking news: I got a haircut. I tried as hard as I could to avoid it, but it was getting a bit too ratty at the ends for my liking, so I convinced my wee brother to give it a trim for me. Amateur photographer and hairdressing extraordinaire, that's him. The past few days have been chilly but still really sunny, which is my favourite kind of weather because I get to play the layering game. I've been wearing this Sheinside jumper more often than I'd like to admit, but I think this is the first time I've worn it on here. It's really well priced at £13 and is SO COSY; think teddy bear material. I pulled this Primark coat out from the dark recesses of my wardrobe to wear with it, I think I got it for about £10 in the sale last year and loved it so much I went back and got it in navy as well (shameless I know, but I got for £1 because it had a stain on the pocket, which makes me feel less like a shopping addict and more like the ultimate bargain hunter). The shoes I was wearing are a wee bit tight - if you order I'd recommend going a size up - so my feet are currently paying for that mistake. Thank God I have my comfy clog slippers. Amazing outfit! The shoes are lovelyyyy, and your lippy colour looks great! 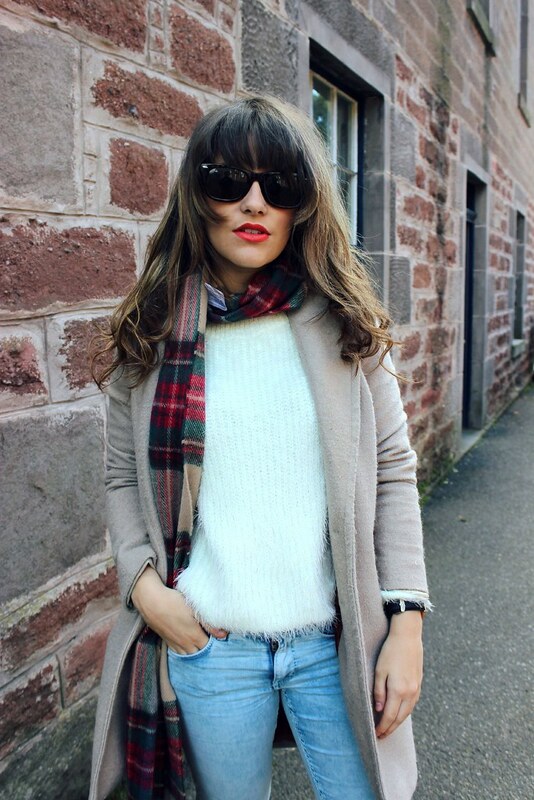 Perfect autumn outfit, I always love a tartan scarf with a cream jumper! That pale blue topshop coat is to die for! Perfect outfit for this horrible weather, love your shoes. Love that coat- what a bargain! Wow, your hair looks gorgeous- a real touch of Hollywood glamour! 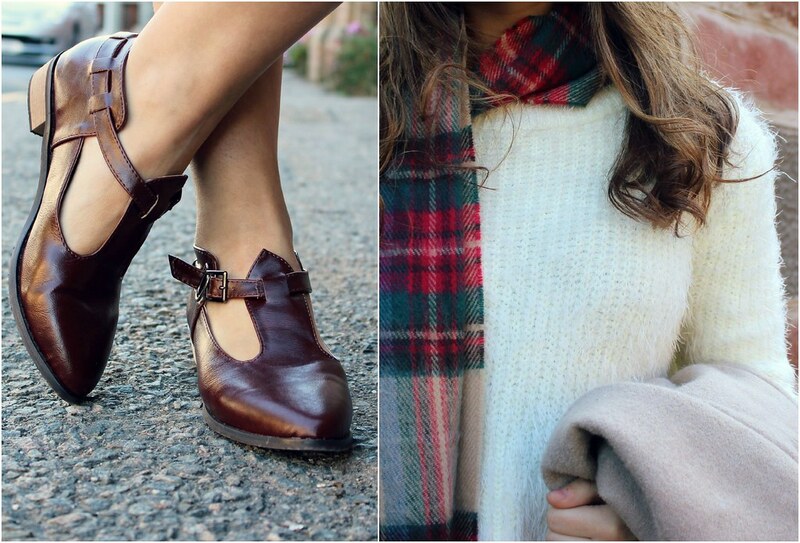 Love the Autumnal scarf too. That jumper looks super cosy! This outfit is everything A/W i love it! Love your new hair and if your brother is so multi-tasking then I would like to meet him! May I ask you if these shoes are wide fit? I am wearing a size 7 so was hoping to get the size 6 (that's the biggest size they have). What do you think? Can't believe this coat is from Primark, it's beautiful!! Love the fluffy jumper & shoes too, this outfit works so well!